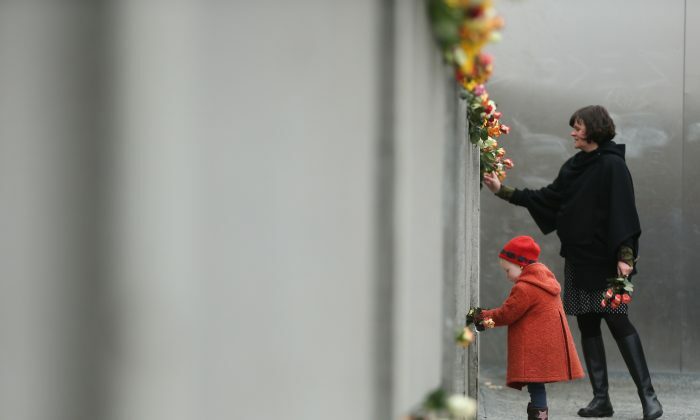 BRUSSELS—Twenty-five years ago, the wall that divided Berlin into what had become a microcosm of the divide between communism and democracy in Germany, was finally breached. “At the beginning, we could not believe it, but we had the feeling of a very historical date,” recalled Constanze Krehl, a member of the European Parliament (MEP) from Germany in a video statement. The infamous Berlin Wall that kept a portion of the German city controlled by the Soviet-led eastern bloc from the western part, controlled by the U.S., France and Britain, was opened after 28 years on Nov. 9, 1989. Over 130 people died trying to climb over the wall to escape from East Germany, which had a poor economy, little food, and close surveillance by the soviet military. More than 5,000 people attempted the escape after the wall went up but were caught and punished. The gate in the wall, known as checkpoint Charlie that later became a symbol of the Cold War, was opened after months of protests. That night, thousands of West and East Germans gathered there to celebrate their newfound freedom in East Berlin and unity with friends and family in West Berlin. “I followed the crowd, and ran to checkpoint Charlie. It was the most important event of my political life,” said Alain Lamassoure, an MEP from France in a video statement. A united Germany has since played an important role in the makeup of the European Union. After the dissolution of the Eastern Bloc, countries like Bulgaria, the Czech Republic, Hungary, Poland, Romania, and Slovakia eventually joined the E.U. Former countries of the Soviet Union, like Estonia, Latvia, and Lithuania have become E.U. member states as well. A piece of the Berlin Wall is still on display in front of the European Parliament as a reminder of those who died fighting for freedom and the role it played in the history of modern Europe.